I regularly recommend this books to runners and non-runners alike. First off, it’s a great story, full of inspiration of many different kinds. Second (and probably more importantly) it offers a wealth of debate to challenge everything you’ve ever thought you knew about footwear and running as a high impact sport. Thirdly, comparitive study of the sociology and psychology of the Tarahumara provide astounding revelations on the link between the mind and performance. 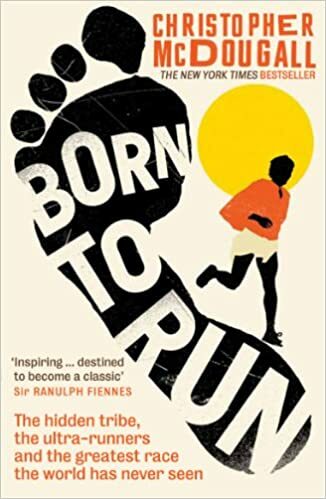 Born to Run holds enormous value for anyone looking to “rethink their feet” something I encourage many of my clients to do; regardless of how they plan to use them. Often when prolonged sitting causes discomfort, we look for ways to support the body. We commonly believe that we should somehow prop the body up to relieve our aches and pains. Lumbar and arm supports may feel like relief in the beginning, but keeping an area in constant rest mode just makes it weaker and recovery that bit further away. In good alignment the body supports itself, using low level activity in the muscles designed for that purpose, bringing relief to shoulders and lower backs. I regularly coach clients in the full aspects of Active Sitting when they visit the clinic for treatment, an illustrated description of all the information is emailed after the session, for future reference. This time next week, we will all be in a field in Warwickshire, surrounded by West African beats! Mandy Elliott aka Leamington Massage Therapy will be one of the Massage Therapists onsite for the Geneations Tour 2015. By day the Rum Bar will be the place to find therapies. Mandy will be taking appointments between 1pm-5pm Thursday 29th April-Monday 4th May inclusive. In order to provide affordable and effective treatments for as many people as possible, Mandy will be offering the following specialised menu each day between 1pm-2pm and 4pm-5pm. A quick (5 mins) percussive treatment to get those muscles ready for action. Also 5 mins but this time with a slower deeper tempo to help the muscles cool down and recover from activity and prevent soreness developing. The short treatments mean I can see a maximum of 10 people an hour, with over 200 onsite, it makes sense to book early. A printed diary will be on display in the Rum Bar thurs-mon from 12.30pm-5pm for you to book your slot. You will need to fill out a short health questionaire before any treatment, so arrive a few minutes early for your first treatment. It’s going to be a great weekend, see you there! There will be no clinic availability from weds 29th April-mon 4th May inclusive. I will be providing massage at a local event, for workshop participants in West African drumming and dance. I’m feeling excited and very honoured to have been invited to observe a 4 week programme of Persistent Pain management Workshops at the Royal Orthopaedic Hospital Birmingham. The clinic runs on a multidisciplinary approach with Dr Grehame Brown, orthopaedic physician and co-author of the self help manual (link below); Abigail Darling, Human Givens Therapist and the physiotherapy department. Lovely to see this holistic approach in an NHS setting. Do you have a stiff neck? clunky shoulder? a knee that never feels quite right? Most of us carry some sort of niggle around with us. Try this. Scan your body for any bothersome areas, shut your eyes for a moment and conjure up any thoughts, colours, emotions that spring to mind, write them down. Now do another body scan and find an area that has no niggles, you probably don’t usually even notice this bit of you. Again focus in and take note of the way it makes you feel. In all likelyhood, the images and feelings about your niggley bit will have come out on the dark and negative side, while the usually ignored, non niggley part will have conjured light and bouncy thoughts and feelings, possibly even a glimmer of optimism that more of you could feel this way? So I ask you, do we focus too much on our pain or discomfort? Have I just put myself out of business? Look out for more posts on the Headology of Pain and Discomfort coming soon. I read a lot of material on ways to enhance body awareness and different forms of exercise to suit the full range of clients that come into my massage therapy clinic. There are few books I would recommend so readily to so many people.The information presented is masterfully accurate and concise, although it can take a while to process as you apply it to your own body. The practical elements are called explorations, rather than exercises, as the aim is to have readers understand and experience balance in a range of everyday situations. After practising for a while the reader is equipped with a very firm foundation for movement.
. I have been studying this book for a while now, written by probably the most controversial voice in the world of bodywork. In a nutshell the theory goes: Posture is irrelevant, forget muscle imbalances, it’s all about motor control. Will be spending this weekend consolidating and asking awkward questions. Will be back March 3rd with improved understanding and skills to assist more people to move with greater ease. Take a break from the cold with this tropical treat. A unique blend of aromatic herbs are heated and applied to the body’s energy lines, stimulating energy flow through the organs and tissues. What a scrumptious way to brush off the winter blues! Click on the Hot Thai Herb tab for more details. Call or email to make an appointment or purchase a gift voucher for this treatment. Gift vouchers from Leamington Massage Therapy are valid for 3 calendar months.